After reaching the Stanford final, Coco Vandeweghe is ranked a career-high No. 69 in the world. STANFORD, Calif. -- On Monday, when the rankings are released, the United States will find itself in an enviable position with nine women ranked inside the top 100. Serena Williams, who bested fellow American CoCo Vandeweghe, 7-5, 6-3, to retain her Bank of the West Classic title on Sunday, is the highest-ranked U.S. woman at No. 4. Serena is 30 years old, while her sister Venus, who is ranked No. 68, is 31. Lefthander Varvara Lepchenko, who is ranked No. 44, is in the prime of her career at the age of 26. But every other player is 23 or under, which is a great sign for the future. In fact, it’s a very good sign for the here and now. The tall and athletic Vandeweghe is only 20. Christina McHale, who will play this coming week at the Mercury Insurance Open in Carlsbad, Calif., is also 20 and is ranked a career-high No. 28. Sloane Stephens, who will also play Carlsbad, is only 19 and is the youngest player in the top 50 and the age of 19. Jamie Hampton and Irina Falconi round out the top 100, and 20-year-old Melanie Oudin looks like she will again crack the top 100 soon, while Lauren Davis, who is only 18 and will play Carlsbad, too, is making a strong run at a double-digit ranking. While none of them have the resume that 14-time Grand Slam champion had at a similar age (Serena won her first Grand Slam title at the 1999 US Open at the age of 18), they have all shown improvement this year, and all have real positives to their games. Vandeweghe can hit a 120-mph serve and win points with huge groundstrokes in the blink of an eye. Stephens is fleet and has ample power off the ground. McHale is also fast and has an air-tight game. And the list goes on. "Coco has a strong and solid game," Serena said of Vandeweghe, who will crack the top 75 for the first time. "She has beautiful stokes. Sloane has such smooth strokes, smoother than mine. She’s also a great athlete and a thinker, and I love that about her. Christina moves unbelievable. I can’t say which one [will end up being the best] because it could be anyone. But anything is possible." Vandeweghe had never met or exchanged words with Williams until this week, and she wowed Coco on court and during the presentation ceremony. She served for the first set at 5-4 but could not cash in on her only set point when Serena buried a cross-court backhand return. Williams needed six break points to break back to 5-5, but Vandeweghe eventually double faulted. Serena won the first set when she nailed another big return and coolly sat on one break in the second set until she ended the contest with a forehand down-the-line winner. Coco went as hard as she could at her, but it takes a near-perfect match to upset Williams on a fast hard court. "I have been serving well all week, and I still feel like I served pretty well against Serena, but she’s a great player, and she is going to take advantage of opportunities, especially on second serves on set point," Vandeweghe said. "In my other matches, I was able to power through most of these players, hitting a big serve or getting a short ball and hitting outright winners, or I’d hit a hard return, and they'd miss, but with Serena, I couldn’t do that. She doesn’t given you a lot of free points." During the trophy ceremony, Williams lavished praise on the young woman who had grown up watching her. "What really impressed me about her was how she is as a person," Vandeweghe said. "She said she was so tired of hearing there are not other good U.S. players and that I was proof that there are. That meant a lot to me." With all the praise heaped on the younger set, Williams deserves a lot of praise, too. She won her 43rd career title, tying her with her older sister Venus for the most titles among active players on the WTA Tour. She’s won 28 out of her last 29 matches and showed up and defended her title at Stanford, even though she was jet lagged most of the week due to the fact that she just arrived in California two days after winning her fifth Wimbledon title. She now leads the Emirates Airline US Open Series points race with 75 points. She will take a couple of days off, play a match in World TeamTennis and then go to London early to prepare for the Olympics. She badly wants to win her first gold medal in singles. 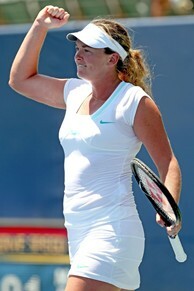 Vandeweghe will head to Carlsbad to contest her home-area tournament. As ESPN analyst Brad Gilbert said, it’s a great chance for one of the young U.S. women to go out and take the title. The desire seems to be there. Now it’s just in the execution. "We all want it, and that’s part of what it takes to do it – to really want it," Vandeweghe said.